The votes are in and the jury has picked a winner. Local Motors first sports car is called the SF-01 Street Fighter, and it's packing a tubular body, inboard suspension, can fit an inline-four, six, or even a V8, and it has a trunk. Greg Thompson beat out 200 other designs to win the Sports Car Platform Design Contest, and for his efforts he'll receive $7,500 and get a royalty for every vehicle LM sells based on his design. And it is a damn tasty design. First, it's got a longer wheelbase than many of the other submissions, measuring in at around the mythical 100 inches (101.13 at max), with a maximum track width of 61 inches, and a series of slippery, open-face molded body panels that should balance aero with style. 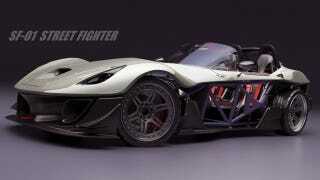 Introducing the new Street Fighter 01(SF-01) from Local Motors. The SF-01 aims to be the ultimate affordable high performance track enthusiast platform on the market. This sports car will be the first in a line of vehicles based on a strong light weight tubular frame that is both suited for inspired commuting and track day events and approved race series. Featuring unique inboard suspension and the ability to accommodate various engines including Inline 4's, Inline 6's, V8's and more all within a mid engine front orientation layout. The SF-01 combines the best in light weight performance with the practical needs required to use the vehicle as a sparse and enjoyable commuter. The longest wheel base configuration was chosen for the SF-01 for several reasons. One, it allows for a roomier engine bay. This allows a larger variety of engine candidates while still keeping a mid-engine layout. Another reason is to allow for a lower frontal cross section from the bodywork. This provides better aerodynamic stability, performance, and gives the SF-01 more of a rear engine stance and look. The front clam shell houses an independent hood panel that can be swapped out or customized to cover which ever engine is selected. All body panels on the SF-01 are designed to be easily manufactured. Every panel can be produced using a one piece open-face mold. The SF-01 ensures the owner plenty of storage space, given the car segment, to meet most needs. There is a recessed trunk aft the fuel cell as well as a pair of storage bins nestled above the rear wheels. Several COTS (commercial off the shelf) items come together to complete the DOT requirements of the vehicle including Hella Bi Xenon headlights, Dodge Dart tail lights, and universal motorcycle LED blinkers. The Local Motors SF-01 Street Fighter, ready for the road, built for the track! The 2nd place winner was the LM Track Fighter by Gabriel Hantig (above) and third place was handed to Narcis Mares' The Spun (below), who took the the 7 aesthetic and added some Local Motors flare in the form of Rally Fighter-style headlamps. From here, Local Motors will begin to work on R&D for the SF-01, picking components, analyzing materials, and beginning to lay the ground work for the production processes, and we should start to see the fruits of their labors later this year.